Lucky Links offers a jackpot of up to $50,000 and a unique playing experience. Instead of picking numbers, you get 8 randomly assigned to you and arranged in a pattern on your ticket. Every day, 8 winning numbers are drawn. 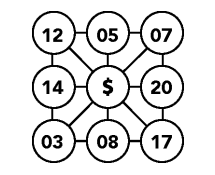 Your prizes depend on how many straight horizontal, vertical, or diagonal lines are formed by the matching numbers on your ticket. If you get 8 lines, you hit the jackpot. You can also pay extra to activate 2XPOWER, which doubles your prize if you have 3-6 winning lines on your ticket. Lucky Links draws are held every day at midday.